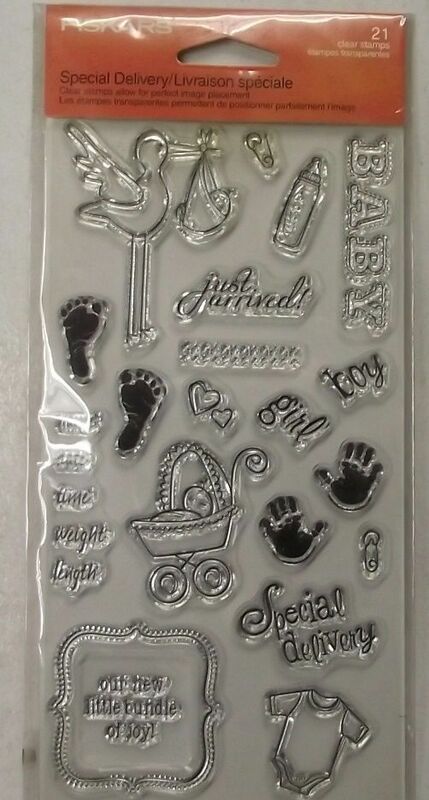 Fiskars 01-005527 4" x 8" Clear Stamp Special Delivery Clear stamps cling to any of our stamp plates, and can be easily arranged, re-arranged, saved and re-used Many different designs, shapes and sizes Several stamps designed to work with Fiskars Squeeze Punches Stamp will not yellow over time If you are on our store, and are interested in more of our items, we do offer combined shipping! Please understand we cannot see the items in your shopping cart!! To receive a combined shipping invoice, please complete the following steps: Click the buy it now button in each listing for ALL of the items you want to purchase. Before you pay, send us an email requesting combined shipping. Once your request is received, we will combine your order and send you a corrected invoice. AFTER you have received the corrected invoice, you may pay for your order. For shipping outside of the contiguous US, or international shipping, please contact us. If you have a question about one of our products, please email us or call us at (208) 424-3370. We check our email regularly, and try to get questions answered as quickly as possible. Much of our inventory is kept offsite from our offices, so if you have a question that requires us to get the physical item in order to answer it, please allow at least two business days for a response. Aeronca weiser Bonus: PayPal buyers get complimentary access to cripedistributing's weekly newsletter.